WHY USE STANDARD COMPONENTS WHEN DESIGNING AND MANUFACTURING? In industry, very little could be manufactured by mass production, without a supply of standard components. The fact that standard components are available, means that many of the products we buy and use today, can be manufactured in their thousands / millions, ready for consumers. Take for example, the mobile phone. There are hundreds of components inside a typical mobile phone. Some of these components are used in all mobile phones (regardless of the manufacturer - Samsung, Nokia, Blackberry etc...) and in other electronic products. Electronic components, such as resistors, transistors, integrated circuits (ICs) and many more, are supplied by electronics manufacturers, in their millions, to mobile phone manufacturers. Each mobile phone manufacturer has a model, with a range of features and functions. These companies assemble standard components to form their own unique product. 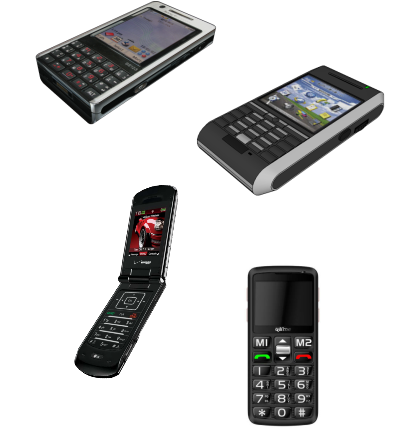 Mobile phone companies also have their own specialised components, these are also manufactured to a standard size / voltage / tolerance etc... so that they can be used across a range of their phones. Electronic component manufacturers, manufacture diodes, resistors, capacitors and transistors to standard sizes and standard electrical specifications. Although hundreds of different resistors are available (300R, 1K, 1M etc...), they are all manufactured to a specification / written standard, allowing customers to choose the ‘value’ and dimensions of the components they require. This applies to most electronic components. Security alarm manufacturers use standard electronic components to produce their own ‘alarm’ products. Without the supply of standard components, products such as these would be simpler, less sophisticated, much more expensive and less reliable. TV manufacturers, computer manufacturers and mobile phone manufacturers, order the components they need, with the knowledge that they have been manufactured to a strict standard. This allows manufacturers to design their own, more complex products, that can be manufactured in thousands or even millions, assembled from standard components. Car manufacturers, assemble thousands of cars every week, with most cars composed of standard components. Car manufacturers, such as Volvo, Ford and Nissan use many of the same components. This includes, windscreen wipers, bulbs, brake pads, electronic systems and even satellite navigation systems. All are standard components. The use of standard components, allows manufacturers to keep the cost of individual cars as low as possible. It also ensures that quality is maintained.